Sometimes it is a bad part… sometimes. The 8088 Project Book a few clocks after dropping RESET back to zero, the 8088 should raise ALE after placing 0xFFFF0 on the address lines. I tried debugging to the best of my limited abilities and could not seem to get the 8088 to behave. I dropped by EEVblog forums to get some help. Turns out those older CPUs were / are pretty sensitive to the clock levels and the 8284 was not producing a valid clock. After a bit more debugging I decided to punt and order a new 8284 — this time from arcadecomponents.com. After the new 8284 arrived, I dropped it in as a replacement for the 8284 from Jameco I previously used. Success! Good looking CLOCK, READY, and RESET signals from the 8284. But still no good ALE, address lines, or boot sequence from the 8088. 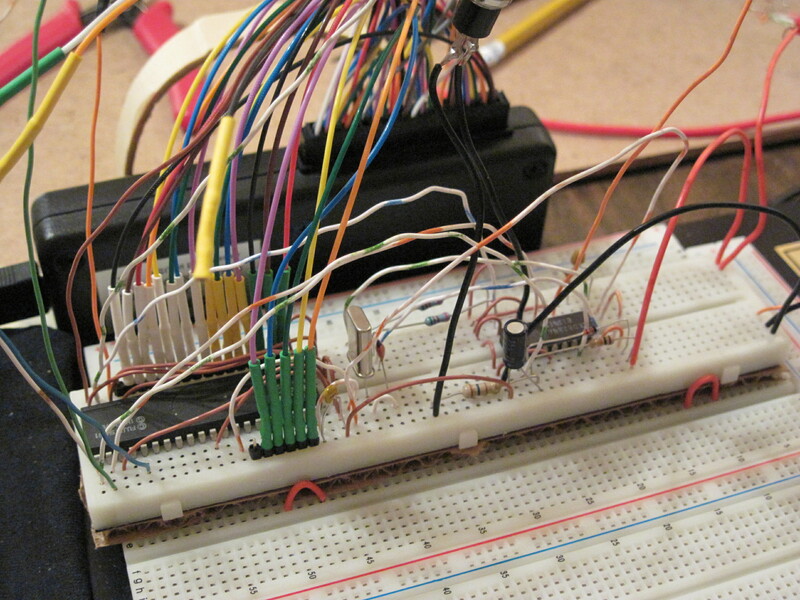 Tonight I decided to move the 8088 from one breadboard to another and rewire the 8088. Breadboarded 8088 (on the left) and 8284. I’m not sure whether it was using the different breadboard or just the rewiring but I was able to get a good boot sequence. Joy! A shot of the signals via an Intronix LogicPort. Next stop… adding some address decoders, a ROM, and some SRAM. I guess using breadboards on frequencies higher than a megahertz (or even 100kHz) is not very good idea due to signal integrity problems. I would recommend doing a wire-wrap or point to point soldering.